This time I just mixed them up with some spaghetti but you can use them in so many more ways than that. Use them on homemade pizza, let them cool down and some fresh chopped herbs to make a nice side/salsa for grilled meats or why not build an awesome baguette with some salami and stuff? I'm sure that you can figure out many more uses for them. I used baby plums, if you use bigger ones - adjust the timings upwards in order to cook them well. For once I didn't have any parmesan at home, but if you have some - it is awesome to grate some of it on top of this dish. Put some tinfoil onto a baking sheet. Put the tomatoes onto the tinfoil, cut side up, and drizzle with some olive oil and season well. Mix the olive oil, mixed dried herbs and garlic in a non-reactive bowl. Pop the baking tray into the oven for about 20 minutes or until they start to turn brown. Once the tomatoes have reached this stage, take them out and mix in with the contents of the bowl. Pour the tomato mix back onto the baking tray and put back into the oven for about 5 minutes. 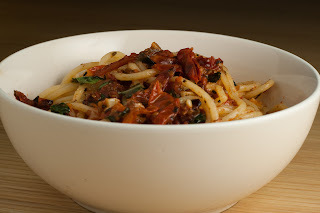 Remove the tray, pour the tomatoes back into the same bowl and stir in the basil. Stir the tomato mix through the spaghetti and serve up. The cucumber can easily be prepared the night before, I'd actually go as far as saying that you should prepare it the night before. Just to make sure to get the flavour to bite properly. As you see I haven't given any set proportions for the marinade - it's a bit of trial and error really. It all depends on your personal preferences - freestyle it until you're happy with the taste. 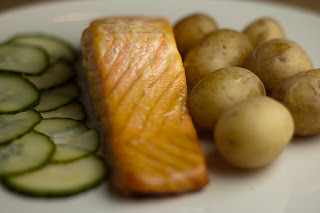 The pickled cucumbers reminds me of dinners from when I was a kid, as do the salmon. There is something about the mix of the sweet honey and the sharp mustard that makes it very Swedish to me. Cooking the salmon this way really keeps it nice and moist. Put the cucumbers in a non-reactive bowl and add the other ingredients. Cover and put in the fridge for at least a couple of hours, preferably over night. Remove from the fridge before serving, drain the liquid and allow the cucumbers to reach room temperature. Taste the cucumbers, if you think they are too sharp - put them into a colander and run some fresh water over them to rinse off some of the vinegar. Add all the ingredients for the marinade to shallow dish, mixing it well. Pop in the salmon fillets, making sure to dip them well in the marinade to cover them. Leave the fillets skin side up, cover the dish and put it into the fridge for at least 2 - 3 hours. When it's time to cook, pre-heat the oven to 200c. Take out the fillets from the marinade and put them on a lightly oiled baking sheet, skin side down, and put into the oven for 12 minutes. Take the fillets out of the oven and sprinkle with some flakes of sea salt. Serve with cucumber slices and boiled new potatoes. 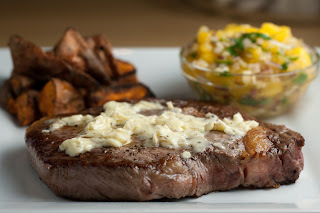 There are days when only a steak will suffice. You just can't beat the meaty goodness you get from a nicely cooked, or almost uncooked in my case, steak. The sweet potato wedges were seasoned with smoked salt - a experiment that worked really well. I've had the smoked salt kicking around in my kitchen for some time but this was the first time I tried it. I'm sure that you'll get tired of me using it in various recipes soon but I really liked the extra dimension added by it so I'll be using it quite a bit now I think. 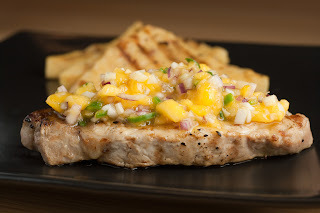 The final two parts to the equation were a very simple garlic butter and some leftover mango and fennel salsa. I'm banging my own drum again, but this was a very tasty dinner. Mix together all the ingredients for the salsa in a non-reactive bowl and put to the side to allow the flavours to combine. Once done, do the same for the garlic butter. Put them on a baking sheet lined with baking paper. Bake for 30 - 35 minutes, or until done to your liking. Rotate the wedges a couple of times during the cooking to make sure to cook them evenly. Heat a frying pan on a medium heat. Season the steaks and drizzle them with some olive oil. Cook the steaks to your liking. Let them rest for 5 - 10 minutes before serving. Spoon some garlic butter on top of the steaks just before serving. I had one more trout fillet left from the pack I bought the other day. Not wanting to waste it I had to think up something different to do with it. I really liked the simplicity of oven baking it in a foil parcel so that was the starting point. 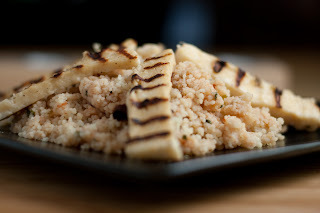 Since I like couscous quite a lot I thought I'd go down the route of a couscous based salad. I don't have a garden so I can't really grow my own lettuce etc, my cheat option is bags of salad from the super market. I know that I'm bad, but not much I can do about that right now. Lightly grease a sheet of tin foil with butter. Put the fillet on the tin foil, skin down, and season well. Pour on the soy sauce. Make a loose parcel by folding the tin foil over the fish. Put the parcel in the oven for about 15 - 20 minutes. 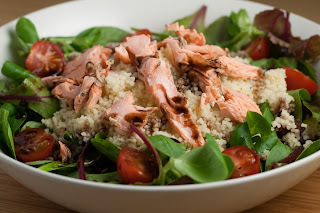 While the trout is cooking, prepare the couscous. Plate the salad and tomatoes. 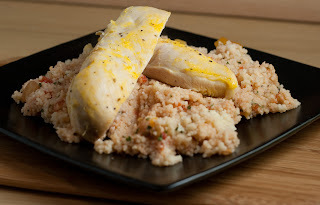 Add the couscous and flake the trout on top. Drizzle with raspberry vinegar. This is my preferred way of cooking burgers if I can't use a barbecue. By cooking them this way you end up with lots of nice meat juices in the buns. As always, freestyle the toppings and condiments. However, I would recommend just using salt and pepper in the mince - just to keep it as 'meaty-tasting' as possible. I've tried many different buns for this but the only type I never used more than once is the so called hamburger buns that you can buy in the shops. They're too thin and taste like cardboard. Pre-heat the grill in your oven. Season the mince and mix it gently. Try not to compact it too much. Put mince on top off the bottom part of each bun, making sure to not make the layer too thin and trying to cover all of the bun. 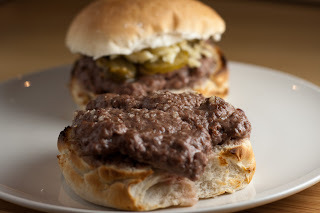 Put the bun and mince under the grill and cook until done to your liking. Towards the end, put the tops of the buns, cut side up, under the grill too so they get a bit of a crunch. Assemble burgers with your favorite toppings and condiments. I've eaten rabbit on quite a few occasions but this was the first time I've tried my hand at cooking it. It was during one of my normal strolls in the supermarket that I noticed something new on the shelf in the meat section. There were new packages containing rabbit. The choice was between a half rabbit or some diced meat. This time I went for the diced variety, next time I'll go for the other one. The packaging wasn't all that helpful when it came to cooking ideas. It went something along the lines of: Coat pieces in flour, fry until lightly browned, put in a casserole dish, cover with liquid and vegetables, cook for 70 minutes in a 170c oven. As I said, not too helpful. But this is what I came up with, I think it tasted very nice. On a sidenote, as you can see I served it on mixed beans. It worked, but I think mash or perhaps just boiled potatoes could work better. Pour the flour into a plastic bag and season well. Toss the rabbit pieces in the flour and put to the side, preserve the flour. Heat some olive oil in a deep frying pan and fry the rabbit, in batches, until lightly brown. Put the rabbit into a casserole dish as you go. Once all the rabbit is done add some more olive oil if needed and fry the garlic, onion and bacon until the onion is starting to soften. Add the leek, carrot and mushroom and fry for another 3 minutes or so until stirring in the reserved flour. Keep cooking for another minute, stirring all the time. Add the stock, brown sugar and vinegar as well as the soy sauce, mustard and dried herbs. Keep stirring as you bring it to the boil. Once boiling, pour it over the rabbit in the casserole dish. 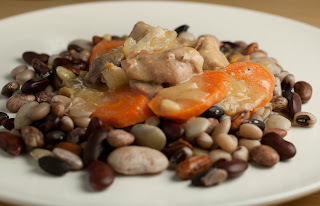 Pop the casserole dish into the oven for about 70 minutes or until the rabbit is nice and tender. It wasn't long ago that I found out about a new-ish Nordic restaurant in London. Having had a look at their website, http://www.madsenrestaurant.com/, I quite quickly decided that I needed to go there next time I was up in London. Recently I had some time off and we decided that a visit to London and Madsen Restaurant was a good idea so a table was booked for three of us for lunch. It is just off South Kensington tube station so getting there was well easy. The restaurant itself was nice and airy, with a couple of tables outside. The design was what most people would think of when asked to describe a typically Nordic design. As I said earlier we went for lunch so we could only order from the lunch menu. Having said that, none of us had problems finding something that appealed. What was ordered was roast pork, large Greenland prawns, a medium herring platter and a breaded pan-fried fillet of plaice. All of these dishes tasted very good and the presentation could not be faulted. 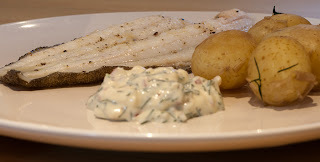 The herring was a real surprise, I had not expected it to be of such a good quality. The person(s) responsible for the different marinades deserves all the credit I can give them. None of the dishes failed to remind me of what I used to eat 'back home'. It was like being transported home for an hour or so. The prices were very reasonable, especially for being in London. Don't tell them but I'd be happy to pay more for that quality of food. I'll definitely be back to try their dinner menu. Mikey says: If you're from a Nordic country, stuck in the UK, and want a taste of home - book a table as soon as you can. If you're not from a Nordic country but curious as to the Nordic cuisine, book a table - you would have a hard time to find a better introduction than what Madsen Restaurant offers you. I cooked them in the oven this time but they would go really well on the barbecue. Just pop them on some indirect heat and drop the lid. Cook until done, easy-peasy. The homemade spicy wedges were a nice and simple compliment to make it a bit more of a meal. Cut out a triangle all the way lengthways in the hot dogs without cutting through to the bottom. Spread the cut with mustard and then fill it with grated cheese. Wrap each hot dog with one or two slices of bacon. 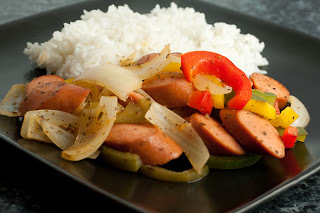 Put the hot dogs on a baking tray and pop in the oven for 15 - 20 minutes or until cooked. 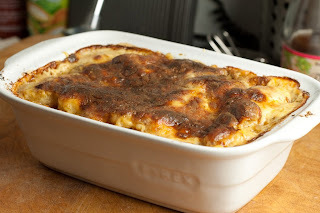 I must admit that I had never tried Cauliflower Puree before cooking it for this meal. The fact that I blog about it can only mean one thing, that I really liked it. 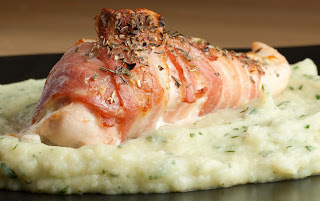 It had a very nice flavour and I liked its texture together with the slightly firmer mash. I didn't do much with it visually this time but I'm sure it can be used to decorate the plate if you put your mind to it. Before you hit the comment button, the tomatoes I roasted were ripe, they are supposed to be that colour. They are a UK grown variety called Sunset Cherry. They can be found in Waitrose (and probably other places). They have a sweet flavour that I really like. 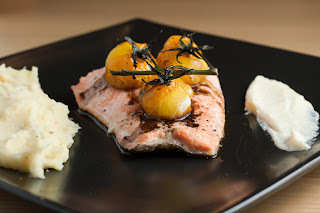 Oven-baking trout like this is a quick and easy way to cook one of my favorite fishes. Not much of effort to pile it in some tin foil and forgetting about for 15 minutes in the oven. As the eagle eyed amongst you will notice, I drizzled the trout and tomatoes with some balsamic vinegar before serving but that's up to you. Make mash your normal way and stir in horseradish sauce to your taste. Put the cauliflower in a pan, pour over the milk and season well. Bring the milk to a boil (don't turn your back while waiting for it to boil) and then turn it down to a simmer. Let it simmer for 10 - 12 minutes or until the cauliflower is tender. Fish out the cauliflower, preserving the milk, and transfer to a suitable container. Add some butter and use a staff mixer or similar to make a puree. If it is too loose, add some of the preserved milk. If it turns out a bit to runny, put it back in a pan and simmer until reduced. Lightly grease a sheet of tin foil with butter. Put the fillet on the tin foil, skin down, and season well. Make a loose parcel by folding the tin foil over the fish. 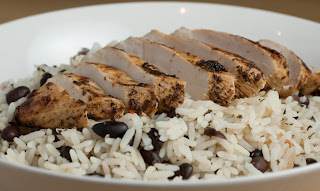 I like cooking with chicken breasts, the variations are almost endless. This time I went for a slightly Italian angle to it all. It wasn't until after I sat down today to get this post together that I realised that what I cobbled together for the mash could easily be made into a pesto, just add some pine nuts. Vary the amount of garlic to your own taste, I can only say that I don't expect to see any vampires for the rest of my life after eating my version. Pre-heat the oven to 200c. Boil potatoes for the mash. Slice the chicken lengthways, but not all the way through. Open the chicken breast like a magazine, put some cling film on top and bash it with a mallet until considerably thinner. Turn the chicken around, put a bit of roasted pepper on one half of it, add mozzarella, seasoning and spices. 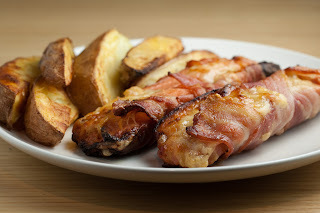 Fold the chicken together and wrap it with the bacon. Top the bacon with some more seasoning and spices. Pop it onto a roasting tray in the oven for 20 - 30 minutes, or until cooked. For the basil and garlic mix just add the basil leaves and garlic to a bowl or similar, add a glug or two of olive oil and blitz with a mixer until a nice and smooth paste is created. Make mash your own preferred way and stir in the basil mix towards the end of the preparation and let it warm through. 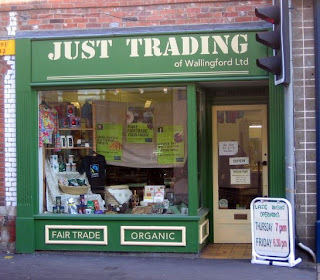 If you do live close by, or just travel past, Wallingford I hope that you take the time to visit Just Trading of Wallingford. They have a great selection of fair trade goods, organic wholefoods, environmental products like washing liquids etc. It's also the only place I can think of where I can find my favorite licorice tea. I can sometimes be a bit hesitant to go for shops like this. Some of them have a bit of that 'holier-than-thou' attitude that really rubs me up the wrong way. Not so in this shop though. The staff (owners/workers?) are all very friendly and helpful and it's not in every shop you get the occasional offer of a cup of tea or coffee when you are just in there browsing. You should really make sure to visit early-ish on a Saturday since that's 'fresh bread day'. The quality of the bread is very high and getting home with a still warm loaf of bread is a good feeling. I've been told that the Chelsea buns are of the highest quality as well. Besides, who could say no to a shop opened by Joyce Barnaby? Mikey says: Visit them if you can, they're well worth all the support they can get. As you might understand from the initial post, as well as this one, I really like the flavours in these kebabs. 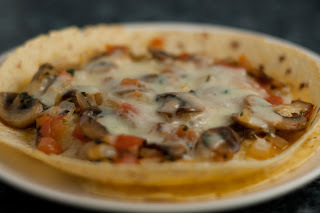 They taste as good, if not even better, reheated the next day. While the kebabs were being reheated in the oven, I popped open a couple of pitta pockets and spooned in some of the garlic free tsatziki. 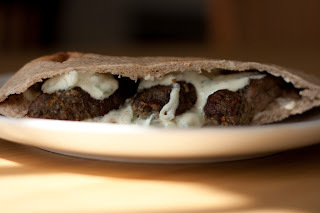 Once the kebabs were nice and warm I sliced them and added into the pitta pockets. This could be the best way to serve these kebabs if you are going for them at a barbecue or picnic. 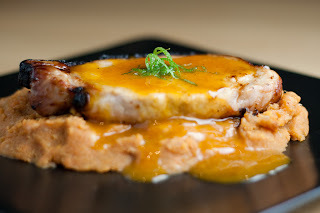 This yet another one of the dishes that I come back to every now and then. It's quick and tasty, a perfect no-brainer to quickly cook after work. You can cook this with as much, or little, kick as you want. Me, I go for quite a bit of hot sauce on this one. Fry the hot dog pieces in olive oil until they start to brown. Set to the side. Fry the peppers and onion in the same pan you used earlier for about 5 minutes. Put the sausage pieces back into the pan together with the oregano, salt, water and hot sauce. Bring to a boil, reduce the heat to low and cover the pan and simmer for about 5 minutes allowing all the flavours to come together. 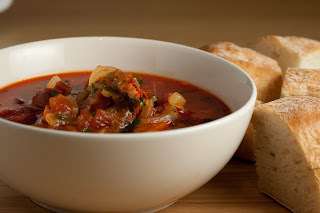 This is a really nice soup that you could either serve as a filling lunch or use as a starter. I guess you could serve it in really small bowls as part of a 'tapas evening' as well. As always, freestyle it to suit you and your tastes. I served this with some fresh crusty bread. Start by frying off the chorizo until it starts to brown lightly. Put to the side. Heat the oil in a large saucepan on a medium heat and cook the onion and garlic until it starts to soften. Stir in the cumin, paprika, chili, chicken stock, tomatoes and half the parsley. Bring this to the boil, add the chorizo and reduce to a simmer. Let this simmer for about 20 minutes. Stir in the remaining parsley and serve.